The last I spoke to my parents I was belligerently crying about how Patrick was every bit the wrong guy for me and how I am completely over it now so I still did not know exactly how to approach breaking my pregnancy news to them. But my brother’s positive reaction was encouraging and I knew I couldn’t keep my secret inside of me any longer so I texted my mom, “Can you go online to chat for a minute? I have to tell you something” and held my breath. Me: no mom, I AM REALLY PREGNANT. Mom: he is the wrong guy for you and you cannot have his baby. Mom: you are so disappointing. And just like that, my mom quickly excused herself, saying something about having to entertain her sisters that were in town, and signed off. I let out tears of hurt and anger, hurt that my mom didn’t want to—couldn’t—talk to me more, to take care of me emotionally while I figured everything out, and angry that she would even try to make me get an abortion. I guess I was naïve to think she would be more supportive but my mother, the gentlest and most caring of souls, was always the one who showed compassion when no one else could find it in their hearts to sympathize and forgive. My mother, blessed with the sweetest disposition, always shielded me from my father’s wrath during the bad times in my childhood and was the first person to selflessly give up everything if it meant allowing her children to have the tools they needed to build a better life than she had in exchange. I was so hurt and angry but most of all, I was extremely ashamed that I put myself in a position to give such terrible heartache and embarrassment to my parents and whole family. Regardless of all the progressive 21th century advocates out there who wouldn’t blink an eye at a child born out of wedlock, I was raised with the firm belief that two people fall in love first, get married, and then have a baby. So while I was already out of love with Patrick, I contrarily discovered in him a new human pulse I had not experienced before and it was just enough to keep me from walking off the deep end. And I was out of love with Patrick, ready to let go of anything we had and could have had right before I found out about my pregnancy, and I knew the easy thing to do was to not tell anyone about this and just get an abortion. But I also knew that I wouldn’t like myself very much for it, that I would forever be haunted by my unborn first child, that I will obsessively think everyday about the child I didn’t fight hard enough to keep. There were no clear answers at the moment but Patrick, much to my consolation, continued to stay by my side and let me decide on my own terms what I wanted to do with my body, with our baby. So while I was already out of love with Patrick, I contrarily discovered in him a new human pulse I had not experienced before and it was just enough to keep me from walking off the deep end. “Wait, I’m getting an ultrasound? Right now?” I asked, completely disheartened that I had prevented Patrick from being here with me to catch the very first glimpse of our baby. “Yep! You can just have your husband come the next time,” she answered as if reading my mind, but No, he’s not my husband thankyouverymuch. I laid down on the fake-leather reclining seat, the material cool against my skin, and the technician stuck some sort of an elongated “camera” up my you-know-what. “Ahh…ok,” she said slowly as she looked up on the screen. She sort of poked and prodded and then exclaimed abruptly, “There it is! You see it? Your baby…and there’s the head and its itsy bitsy body.” She typed out on her keyboard the part of the “blob” that was the head and the part that was the body and she pointed to the little fins that were the beginnings of little baby arms and legs. 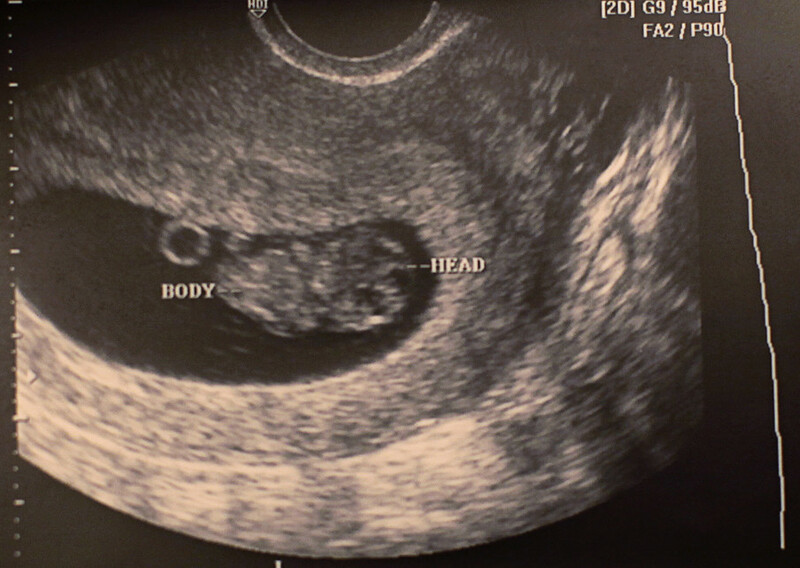 I felt something stir in me, maybe my emotions or maybe I was just imagining the baby moving, and seeing my baby for the first time on that screen was everything and nothing like I thought it would be. I didn’t cry with joy like I had hoped and seeing my two-dimensional baby didn’t make anything seem any more real but something changed in the energy in the room. Something changed as if there had been an acute shift in the universe. Bump-bump, bump-bump, bump-bump the baby said. I closed my eyes—lost, scared, confused, helpless…and maybe a little excited, too—and drowned in the heavy pulsation of life some more. wow that is so incredible how this little bean is now the most amazing little boy. thank you everyone. writing is not always so easy with me esp when i have to revisit some trying times so knowing that you guys are reading and rooting me on really helps me keep it up! thanks!!! Beautifully and wonderfully written. You need to write a novel. 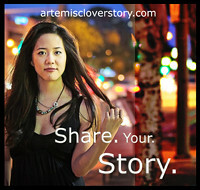 I like your story and want to read more! please! this nearly brought tears to my eyes--thanks for sharing! hi anonymous, thank you for reading and following my story. it was the most difficult time in my life but also very precious. This is such a great story. I'm hanging on bit by bit.